This new version of the Standard Series Locking Side Folding Mount features black tube, giving the mount a discreet all-black appearance. Compact and portable, this mount is designed to fold by the side of the chair when not in use and for easier transportation. The upright and horizontal tubes can be supplied in different lengths to customer requirements. This locking version features the Daessy locking clamp assembly (RFCR and ROP) to hold the mount securely in position, making it suitable for use on Tilt-in-space wheelchairs. Folds from in front of the user down to the side of the wheelchair. 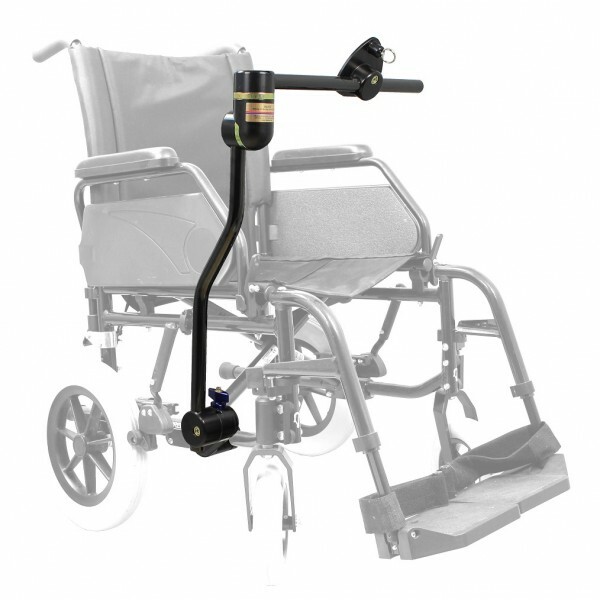 Locking clamp assembly makes this suitable for use with Tilt in Space wheelchairs and for users with uncontrolled movements, where the lock would prevent accidental removal from the frame clamp. Fully adjustable, allows precise positioning of a device. Suitable for devices up to 8kg.